The entrepreneur goes to a financial institution to apply for a loan. See a full list of approved financial institutions. The Loan Officer assesses the application and finds that although the entrepreneur has a good credit rating, adequate collateral and enough equity, there are gaps in the management capacity of the business. It may be a case that there is no (or inadequately prepared) business plan, marketing plan, or financial statement, or the principals/management team will require training in financial literacy, business coaching and or mentoring. These are essential for convincing the officer that the business will be properly managed in order to be able to repay the loan. 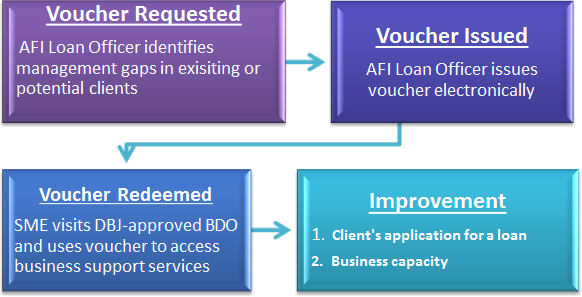 The Loan Officer recommends the appropriate capacity business support service which will improve the application and the entrepreneur’s chance of accessing a loan. See a full list of approved Business Development Organizations. The entrepreneur will choose a Business Development Organisation (BDO) to provide the service recommended and make arrangements for accessing the service. See the acceptable forms of identification to take to the BDO. The BDO will then discuss the scope of assistance with the entrepreneur and both will decide/agree on the cost of the service which should fall within the range listed. Entrepreneurs will pay no less than 30% of the cost of the service. The DBJ will pay 70% of the cost of the service or the value of the voucher, whichever is less. If the entrepreneur so desires, he/she may access services which cost much more than the voucher amount and make their own arrangements for payment. After receiving the service, the entrepreneur will return to the financial institution with better information for a loan application as well as better tools with which to manage their businesses. Project manager evaluates the applications and either approve or deny the request via email. 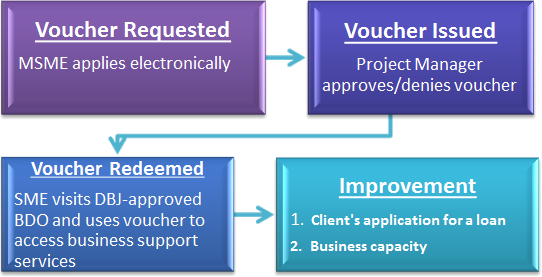 If approved, a voucher is emailed to the client. The project manager will follow-up with clients to track the progress of their business. The client’s business should be improved by the services and may use the resulting document to improve access to financing. Entity is registered with the Companies Office of Jamaica and has valid Tax Compliance Certificate (TCC). The business entity has not received a voucher within the last 2 years. Note: Vouchers are awarded on a first come, first served basis. Note: DBJ will pay to the BDO, the value of the voucher or 70% of the cost of the service whichever is lower.